Hello, welcome to episode 20 of Coexisting With Nonhuman Animals. This episode, live Goldfish Swallowing, the SPCA giving away pearls and SAFE are still focusing on Happy Meat. I'd like to say hello to all the people who read my blog, I write and read from a script as I record each episode, some times you can tell I am reading because of how i am talking like I am reading.... I put the script up on my blog when I post the audio. I like having the script up for people to read, because the more information, the better, but I really would plead to the people who only read my scripts, please listen to the audio as well, I mean, the point of this podcast is for me to play clips for you, you're not meant to be paying attention to what I say! The clips are the whole point of my show, and I dont really want to transcribe each clip I use :) However, if you are trying to avoid hearing my voice, you can always watch the full video clips I include on my show, these are listed at the bottom of each script. My good friend William mentioned two news stories that I was allowed to steal and claim as my own. Those being a bar offering $10 alcoholic drinks with live goldfish inside, and that the SPCA had a competition where you could win a pearl necklace, um, its an item of jewelry. I'll start with the Goldfish. I dont know how Universities work worldwide, it seems to be a worldwide thing, but in New Zealand at least, at the start of each year is "Orientation week", known as "O Week". Its basically a lot of drinking games, and participants often end up almost naked. A bar in Hamilton offered alcohol with a live goldfish in the glass, to be swallowed whole. This is hosted by Paul Henry, who normally is in the news for saying shocking things. He was quite dismissive of the controversy surrounding throwing dead rabbits about as a competition, I covered this on episode 2 of this podcast. In this clip, Paul Henry seemed on the side of the animals for once, perhaps because they are alive, if these were dead animals being consumed, he has no problem with that. Well, as usual, people were mad about this, and you get the usual comments. I'll read one from the Breakfast comment section. "Goldfish are companions not food. I know someone who has had their goldfish for about 10years now. The owner of this bar should die." Why is it unfortunate? "it is unforunate Mr or Ms Fish, but I have to kill you". If you think its unfortunate, then you can change it! Paul Henry, the host in the clip brought this up in his mocking way. Well, the event was apparently called off. People will instead be offered a Chocolate Fish, and a shot of alcohol, AND an SPCA donation box will be at the bar. The SPCA also show up in my next story, that I pinched from William. The SPCA are one of the largest Animal Welfare organizations worldwide, I appreciate the efforts volunteers do looking after unwanted animals designated as "pets", but they do not represent Animal Rights as if understand the term. For example, the SPCA have a "Freedom Farms" label that can be stuck on packets of meat, if it makes "SPCA Approval Standards". If you are unfortunate enough to find yourself on www.freedomfarms.co.nz, you'll see all kinds of "Happy Meat" propaganda, about how lovely it is for the animals we farm, about how much they enjoy being made into bacon. Like Jesus, they choose to die for our sins. At the bottom of the page, theres an option to "sign up for happy stuff", which is ludicrous. We are asked to sign up for the SPCA's magazine, and theres a prize involved. quote "Take out a subscription to Animals’ Voice in the Autumn 2010 issue and you’ll be in the draw to win a cultured pearl necklace valued at $1000. PLUS there are other prizes and books galore to be won. Remember, a subscription to Animals' Voice Magazine costs just $20 for four issues." I've seen how Paua, or Abalone pearls are "cultured", on a school visit to Rakiura, or "Stewart Island" which is just a short boat ride from the bottom of the South Island of New Zealand away. "Mabe or blister pearls have been grown on Stewart Island by Ron Dennis for about ten years. Ron has been putting inserts in adult paua caught around the island and then holding them on the wharf in flow through tanks and feeding seaweed for up to 18 months, at which time the pearls, meat and shell are sold. Ron has told me verbally that ten to twenty per cent have good viable pearls valued at NZ$70 to $500 each. The pearls have been marketed by Liz and Mike McKenzie, jeweller’s from Christchurch. At the last annual NZ Abalone Farmers conference, Mike said they were penetrating the US market and using Empress Pearls as a brand name. At no time has Mike mentioned prices being realised but it is significant to note here that the McKenzie’s have recently gone into partnership with Ron Dennis on Stewart Island and have just completed a multi million dollar recirculating temperature controlled system capable of holding 30,000 adult paua." The Pearl Necklace that the SPCA is giving away to a animal lover" who's paid them $20 for four episodes of their magazine might not use pearls from Paua, probably they are not Paua Pearls, but surely, the animals involved in manufacture are farmed in a simila r fashion. After all, the SPCA mention using "cultured pearls" meaning the animals were not in the wild, they were grown in vats, tanks and pipes. Its pretty much the definition of factory farming really, it truly is a factory, and I guess the animals are only ever taken out of the tanks, the factory, when they are to be killed. Now, some people might not really even count Paua as animals, they are not the most exciting animals, kind of like a giant underwater snail that has no obvious senses and doesnt seem to move. But, surely they deserve better than to be "cultured" for our use, to have a piece of plastic quote "inserted" into their body, where they detect it as an irritant, and they build what we call a "pearl" about the painful lump. This is not an activity the SPCA should be involved with. They claim, hell, the magazine you are to buy from them, its literally called "Animal's Voice", I think the animals that form the Pearls should be given a Voice, although it seems the SPCA is unwilling to listen. I think this is a problem with the large Animal Welfare groups, they cant speak up for the actual animals, they cant say "we dont think people should wear leather or pearls...", they have feel they need to come up with a "solution" for their financial supporters to keep doing what they've always done, and feel good about it. I've noticed this line of thinking before, you might say something such as "the problem with animals suffering is that we have them as our property in the first place, welfare reform has done nothing to stop the needless deaths of 56 billion land animals each year", which might be answered by "all you do is complain about problems, but you never have any solutions"....except, we do have a solution, to not do it at all! Perhaps the SPCA, SAFE and other large Animal Welfare groups are trying to avoid alienating the people who donate money, by ignoring anything that might require a minor change to the donors habits. I noticed coverage of a young Vegetarian in Tearaway magazine, Tearaway is given out free at schools in New Zealand. The article mentioned SAFE's annual campaign, asking for donations on the street. Quote "...urges all young people who care about animals to take a stand and help with SAFE's annual appeal - and you do not have to be vegetarian to take part, you just need to care for animals." Well, I know the above was not written by SAFE, it was a writer in Tearaway magazine, nothing to do with SAFE presumably, but that idea "you don't have to be a vegetarian", as if not eating meat is such a radical, difficult thing, and then to end with "you just need to care for animals", what?! . I'd think the first step in caring for animals is not to hurt them at all, if we told people about ethical Veganism, "I'm vegan because I don't want to hurt animals in any way I can possibly avoid", then it doesn't sound so freaky, or radical, or hard, or weird. 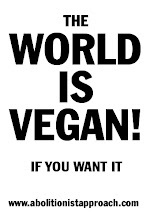 There would be plenty of other vegans if we just promoted Veganism! I thought the line from Tearaway was interesting, and somewhat true, I bet most who donate OR collection donations for SAFE are indeed not Vegetarian or Vegan. And now I'd like to do my final story about Hans Kriek from SAFE in a recent television segment. I'll play a clip about the Animal Welfare code being yet again delayed, and then the Breakfast show clip featuring Hans from SAFE. Hans has been kind enough to reply to my emails a few times now, but I asked for a reply about his latest appearance and got no response. with a 'Go Vegan" campaign." Yes, the world wont go Vegan overnight, but when large groups focus on "the animals that are suffering right now", nothing happens at all, the proposed reforms get delayed such as whats happened now with Pigs. The big industries stall when it comes to changing the pigs stall's, and even on that one issue, helping pigs who are treated in one particular way, we've gotten nowhere, except for more promotion for the large welfare groups. I dont really have many friends who buy "Happy Meat" and other "organic" or "cagefree" products, but sometimes people I know will bring up that the meat they eat is "free range", if they killed it themselves, as if that makes it a positive thing, that I should congratulate them on. If SAFE would join us in promoting Veganism, real Animal Rights, then we could actually help the animals. SAFE sell Vegan products, at "the cruelty free store" as it might be called, and at least some of the SAFE management are Vegan themselves, but Veganism never seems to be mentioned in public campaigns, never. I remain good friends with many people who work for SAFE, but I dont want to promote Welfare reform, I want to spend my time promoting Veganism, that helps all animals. This year I've decided to try and promote Veganism more actively where I live, I've found it hard to hand out pamphlets and other information, but I've got to try. Thank you very much for listening to my twentieth episode. Takeaway magazine "you dont need to be vegetarian to collect money for SAFE"